A devastatingly powerful photo has emerged of a young girl being comforted by her heartbroken parents as she succumbs to brain cancer. Five-year-old Zoey Catherine Daggett died at 4:17 p.m on July 4 after a two-year battle with Diffuse Intrinsic Pontine Glioma (DIPG) — a rare, lethal brain tumor that often originates at the brain stem and is extraordinarily difficult to treat. “At 4:17pm on July 4th 2018 the firecracker of a daughter that we named Zoey Catherine Daggett was finally allowed peace and left her beautiful body. She came into this world on 10/17 at 9:17pm with a flurry of commotion and she left just as quickly; just one day shy of 2 years since her first symptoms of DIPG appeared. “We’ve had two years to prepare for this but it’s never — it’s never enough,” Casey told the Rochester Democrat & Chronicle. 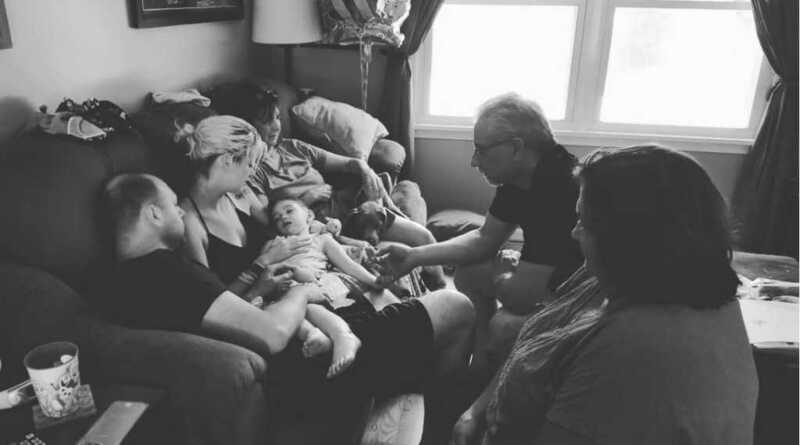 Zoey spent her final day being cradled by her parents and listening to music and stories. They put on one of her favorite movies, “Harry Potter and the Prisoner of Azkaban,” and she passed away peacefully. “Midway through the movie that was it,” her father, Ben Daggett, said. Zoey’s health had declined rapidly since the end of June. “It was probably a month ago we kind of figured out that the radiation wasn’t working anymore,” Ben explained. When it became clear she was entering the final stages of life, Zoey’s parents decided to open up their house so community members, family and friends could come and say their goodbyes. They remember their brave daughter as an energetic, vivacious and caring little one. In July 2016, Zoey lost mobility in her hand, prompting a trip to the emergency room. When the DIPG diagnosis came in, it was devastating for the family. “That was a rough phone call,” Ben said. Casey said that following the horrific diagnosis, she discovered many other families who had encountered this dreadful disease. “DIPG is not curable at all and has a less than 1 percent chance of survival,” she explained. In a bid to update friends and family on Zoey’s treatment, Casey set up CaringBridge and Facebook pages, posting regular updates. “It was helpful and therapeutic for me to write all of it out there and let everyone know what we’re going through,” she said. The photo of Casey with her parents, which has been shared around the world, may assist them in their process of grief at some point. But not now — the memories are perfectly vivid. “Right now I don’t need the photo,” Ben said. In her short life, Zoey certainly lived — her parents made sure of that. Please for this family as they come to terms with such a devastating loss.